What is it with white Budin carbon fibre single action harps? I suddenly come across two of them on the web in one week. Latest edition of Harpers Bazaar magazine has a "Marie Antoniette" style fashion shoot by Karl Lagerfeld with the model draped over one. Q. What's better than Spock playing the harp? ​Having just done a review for the Harpologie Series by Sabien Canton in the the latest UKHA magazine, I've just found a nice video trailer online. The video is in German, but it does the job! ​Harpologie, and Harpolgie 2 are extremely useful books for anyone teaching beginner to intermediate level harp. Each book comes with a play-along CD, which is quite a rarity for beginner harp students. What makes these books invaluable as teaching aids is the fact that not only are the pieces themselves well thought out and structured from a harp playing point of view, but the quality of the compositions and the production values of the backing tracks are exceptional. Witty and fun accompaniments which manage to lift the spirits of both student and teacher! The first book is aimed at the beginner (2nd finger only) to approximately grade 2 standard. The second book is approximately grade 2 to 4 standard. The play-along tracks come in several versions for each piece. Some have a half (studio) tempo, and then a full speed version. I have found these books useful to use in lieu of sight-reading at the end of a lesson. Although aimed at the early levels, they are especially good for anyone who struggles with sightreading up to grade 5 level. Originally published in Dutch, the books have been translated into various European languages. My books are in French and the CD is in Dutch, but nonetheless these 2 books are always my most used books in my teaching bag. I ordered my copies very simply and quickly through Le Magasin de la Harpe . Highly recommended. I think.... it's a Budin carbon fibre single-action harp (I saw a couple of black ones in the Budin shop in Paris a few years ago) with some Do-It-Yourself colour changing LED strips stuck on the edges of the soundboard. 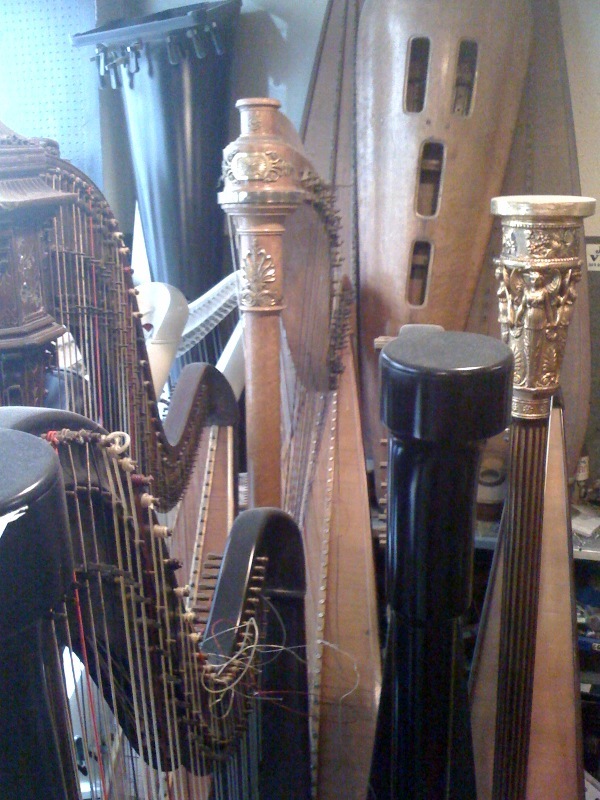 Carbon fibre lever harps are now available in the UK and although they are an interesting harp which would have some really useful purposes being extremely light and able to use in almost any temperature etc, it's currently at a £6,000 price tag for a 36 string harp. Only a couple of weeks to go to the premiere of "A Child Like You" at the Royal Northern College of Music in Manchester on the 2nd May at 8pm. It will be my first time playing harp with a brass band, and it's a real privilege to be playing with a band as amazing as Foden's Band! The piece features my wonderfully talented soprano, Anna-Clare Monk who will be singing and narrating. "A Child Like You" is a 15 minute work written by Andy Scott for Soprano voice/narrator, harp and brass band and will be the centre piece of the first half of the concert on the 2nd May in Manchester. It will then be performed at the Queen Elizabeth Hall in the South Bank on 6th July, and at the Concert Hall in Glasgow as part of the Commonwealth Games celebrations on the 2nd August. If you can come along to any of the dates to support this project that would be brilliant!